Backsmith Advanced Physical Therapy offers land-based highly skilled manual therapy, aquatic, and home-health Physical Therapy in a very relaxed but professional environment. Do you have pain, weakness or instability which keeps you from doing the things you love to do? Do you have high deductibles or no insurance? There now is a new physical therapy (rehabilitation care) option to relieve your pain and get you moving better in the Wausau, Weston, Schofield and Rothschild region. Backsmith Advanced Physical Therapy offers land-based highly skilled manual therapy and home-health Physical Therapy in a very relaxed but professional environment. Aquatic PT also is available. Dr. Voigt Smith has over 27 years of clinical experience and is the inventor of the (twice patented) Backsmith Selective Stabilization Exercise Support. He has twice been certified as an orthopedic clinical Specialist and is Mckenzie Certified (McKenzie International Spine Institute). 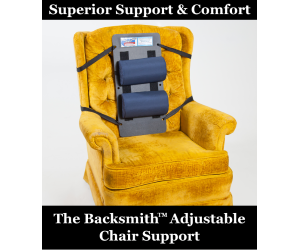 Dr. Smith also is the co-inventor of the Backsmith Chair Supports. His extensive clinical skills & unique physical therapy innovations get clients better faster, often saving them thousands of dollars while greatly improving quality of life. Call for an appointment today at 715-298-5888 and get better faster! We’re located next to Express Employment (near Quirt Dental), on Schofield Avenue in Weston.